What would happen if you got 300+ people involved in digital media creation and curation, public media and news reporters, and even the public at large together to talk about the future of Public Media? Organizers Andy Carvin (who works in Social Media for NPR) and Peter Corbett (from iStrategyLabs) decided to put it together and see what would happen. The result is the first of its kind Public Media Camp hosted by the Center for Social Media at American University this weekend. Content creators and producers, web and application developers, folks involved in public media in many different aspects, from APIs and tools to stories and relationships. The unconference was kicked off by the CEO of NPR, Vivian Schiller, who discussed the changing environments of the modern media culture. Her remarks suggested that 2009 might be “the year everything changed,” suggesting that convergence between public, for-profit, and passion-driven media outlets might be closer than currently is expected. 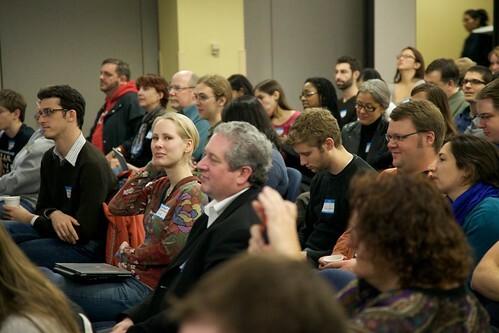 Participants ranged from NPR Ombudsman Alicia Shepard, to developer shops like Development Seed, to producers and developers at WAMU, to documentarists, to the Sunlight Foundation. With the charge given, the unconference divided itself into many skeins, those for programmers, those for producers and content developers, those for the more navel-gazey ethicists and the enthusiast gamer were all on the schedule. So what happened? With the stakeholders of every type involved, sessions emerged in the traditional anarcho-democratic fashion that is the theme of the unconference. The first batch included a spirited discussion (of which I was part) of the roles for citizen journalists and enthusiasts in the media market, as well as a tour of the new NPR API, and a session on creating your own Public Media Camp in your own community. A second round covered the core of partnerships between public media entities and sites like We Love DC, as well as sessions on Disaster Response and Social Media, Copyright & Fair Use, and Getting the Public Involved in Government Data Analysis. The diversity of the crowd made for a vibrant first day, covering all manner of media topics from the future of gaming in public media (c’mon, who wouldn’t love a fantasy sports style league with NPR journalists? I’m taking Nina Totenberg in the first round. Seriously, her stats are amazing.) to deep technical issues facing the engineers behind Public Media. I’d like to thank Peter & Andy for the invitation to check out the camp today, and a special thanks to Morgan Holm of Oregon Public Broadcasting for co-hosting the session on Public Media Partnerships with us. Guy to the far left in the photo is totally using TweetDeck. Busted. Good to see you yesterday Tom. Had a lot of fun. Is this how my tax dollars are being spent? If there is enough money to waste time on an Un-conference, then they certainly don’t need any more money…what happened to all the stations begging because the economy is in the toilet? Collaborative R&D is never a waste of tax dollars Arnold. Not only tax dollars but the money people giving to public radio stations who say they can’t pay their NPR bills and NPR spends money on this? I’m not giving anymore! Arnold, the whole budget for an event like this isn’t much. Space was donated, lunch and happy hour sponsored, so the outlay from NPR/PBS wasn’t much in terms of cost and participation for stations was free. First off, my opinion is mine and no matter how much “isn’t much” it still smells of using listeners money for something other than what it was intended for. And you’re last line in your response makes you sound like a snotty computer kid. Everyone is entitled to be outraged when they think their charitable donations are being misused. Honestly, Arnold, I think I’m being pretty honest about this. Your opinion is yours, but I think you’re assuming facts not in evidence here. NPR and PBS have a budget in the hundreds of millions of dollars each year, so an expense like a $1000-2000 conference sponsorship is too small to be considered a drop in the bucket. When you consider that this was likely professional development for all who attended, it’s money well spent, when you consider that many conferences with attendees like the CEO of NPR and Craig Newmark of Craigslist (who showed up today) are going to be in the hundreds of dollars per person to attend, this was a steal of an experience. Do you get similarly upset when organizations you contribute to send staff members to training? To conferences to discuss what the organization could be doing to better serve their audience? To promote the work the organization has done already? I give my money to NPR because they make great radio news. Things like “Navel Gazing” about the internet instead of working hard on the news is a waste of time. I am INSULTED by the idea of Fantasy sports game being made by NPR. That is NOT what they are about. They are about news. Training that supports a person’s primary job responsibilities is a good use of funds. No matter how little money was spent or how much you defend yourself and your participation, NPR is still supported by people like me who give it money to do what they say they do ….give us the news straight. Not make computer games. NPR has a responsibility, nay a duty, to stay abreast of new media trends and development. In case you’d missed it somehow, NPR is already in the business of making games and entertainment: Wait Wait Don’t Tell Me is a news/comedy/quizshow that airs every Saturday on WAMU for an hour. It’s appointment programming for me, because it provides news AND entertainment AND does it in a way that’s approachable for the Daily Show generation. But, if you want to tell me how much you give NPR each year, I’ll gladly stand in for you this time, because this weekend was an important bridge between generations of participants. Besides, you don’t give to NPR, you give to the station. So, recognize the difference. @Arnold – “things like “Navel Gazing” about the internet instead of working hard on the news is a waste of time” – if newspaper execs had engaged in more introspection, perhaps they would have created something like Google News, acquired or improved upon Craigslist or kept more of the newsroom employed. Instead, the Internet has irrevocably disrupted their business model. Tom’s defense of any expense involved in PublicMediaCamp is valid – sponsorship means that “your dollars” are likely to be untouched. 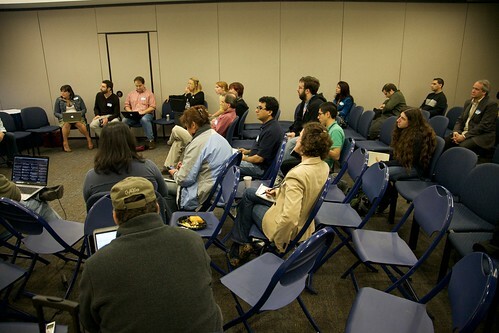 The ideas that were bandied abound at the unconference extend far beyond games to mobile, better us of technology for newsgathering and listener engagement, among many other important areas that deliver on the core mission of NPR. I’d recommend moving the focus past the fantasy news league, which was one idea of thousands. NPR is hardly “just the news”. I would not put “All Things Considered”, “Car Talk”, “A Prairie Home Companion” or WAMU’s “Jazz Saturday Nights” under “news” but these are, in this listener’s opinion, great *radio programs*. NPR does provide great news and that is part of their mission, but they also provide a variety of radio programming akin to the CBS radio of the pre-television age. I am amused and frustrated by the (mock?) outrage put forth by those who clamor for government and those it supports to “be more like business” but then complain when they attempt things that are not, in the outraged citizen’s view, exactly in line with a narrow mission. Events, ideas and cultures are the things it pursues, not just “current events”. If you are so enraged by an entity you donate to not focusing on just news, perhaps you should read their mission statement before accusing them of stepping outside of it. So the guy who says he’s an NPR contributor is being yelled at people who haven’t said they are NPR members. Me thinks the guy who ponies up some bucks is more credible than those who don’t. The argument that giving money to NPR makes one more credible is ridiculous. Donating money to any organization in no way correlates to being well educated and knowledgeable about said organization. Also Arnold/Janet, one easy thing that organizations sometimes do, is allow contributors to earmark their donations for a specific cause within the greater organization. You could check into this with NPR if you’re that concerned about it.